Here you go folks….My Gap information….for what it’s worth! Let me first explain what I understand to be “Gap Shooting”. In the world of archery, we know that the arrow begins from the bow and travels upward in an arc, reaches a peak somewhere along the way and then falls into the target down range somewhere. All arrows do that, some don’t arc as much as others. My 30 pound bow with my draw length and slow traveling arrow arcs a lot and you will see that in my gap chart. So, Gap Shooting requires the archer to go through just what I have done over the last couple of months to determine where you have to “aim” your arrow in order for it to hit the center of your target at various ranges. In order to construct your Gap Chart, you have to pick a point on the target down range, come to full draw and visually place the tip of the arrow on that point and then release the arrow. You will do this at 5 yard increments all the way back to some point where the point you place the arrow at full draw, actually causes the arrow to hit the target at the point you were aiming it. That final spot is called your “Point On” mark. Point on is placing the point of the arrow on THE spot you want the arrow to hit and it actually hits it. I began keeping track of my gaps moving from 5 yards to 45 yards as time went on. On my first and second days my Point On yardage was 30 yards and by the end of my keeping track, things had changed enough to move my Point On mark out to 45 yards. That is a big change! So, let’s look at the numbers. My average Gap at 5 yards for ALL the recorded times was 12 inches. That means my bow and I shoot 12 inches higher than where the point of the arrow is pointed at 5 yards away. For me to hit a carp on the surface of the water at 5 yards away, I would have to actually aim my bow 12 inches under it in order to hit it. Can you see where this is going? Now let’s jump to 20 yards. My overall average gap at 20 yards is 30 inches! In order to hit the target at 20 yards I would have to point the tip of my arrow 30 inches below the target. A mule deer stands at about 30 inches from the ground to its belly. I would have to put the point of the arrow between the deer’s foot and its knee in order to hit the vitals at 20 yards. And in competition if I was to hit the bullseye at 45 yards, I would put the tip of the arrow right on the yellow X and let it rip! So, in all competition, and with my memory not being too sharp, I would need these gap distances written down so I could look at them before each shot. I would have to judge just how far below the bullseye on each target I would have to put the point of my arrow in order to hit the bullseye each time. I would also have to know just how far away the target it each time. So I would also need a range finder. Now let’s say the target ranges at 22 yards. My gap at 20 yards is 30 inches and at 25 yards it’s 29 inches. Not much difference. So I’d pick a point below the target that is around the 30 inch mark and let it go. I should hit within the marked area on a 3D target and score pretty good (all things being equal). And that in a nutshell is how Gap Shooting works. After my change, my gaps recorded like this: 5 yards averaged 15 inches, 10 yards = 27 inches etc., 20 yards = 39 inches and my point on moved from 30 yards all the way out to 45 yards! And now you are asking why I have stopped recording my gap distances. Well, I’m still changing! On 3/20/15 I was drawing at 26 inches. The string touching the front of my nose and my thumb touching and under my jaw. It felt good and I shot relatively well for a beginning archer. I felt pretty good about things in general. On 4/26/15, like I said, I shifted my body in relation to the target and anchored with one more point (the string on my rib). Everything changed at that point. Not only is the bow more solid in my hand, I can look right down the arrow shaft if I wish. Other things have come into play as well. 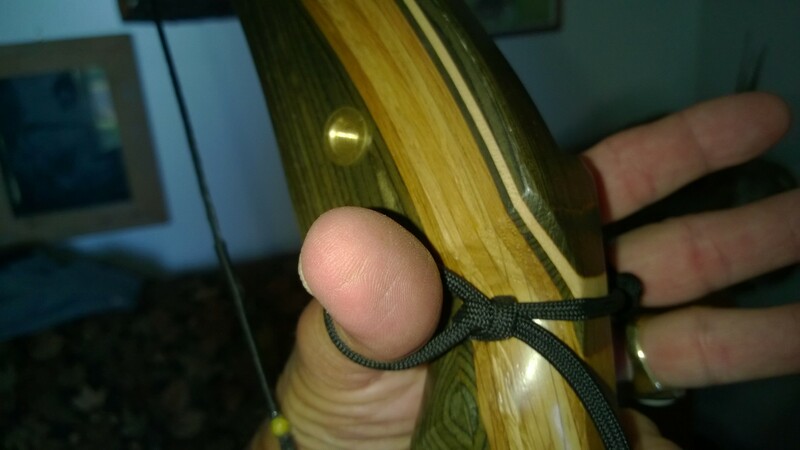 I built myself a finger sling which frees up my mind from having to keep hold of the bow once it’s shot. Just one more thing off my mind to allow me to concentrate on where I want the arrow to go. I have also noted my draw length has gotten longer, about a half inch longer. Now the bow string is touching my nose to the right side of it rather than at the tip and my thumb is farther back on my jaw. Small things I know, but they seem to be playing a big part in how my arrows are going down range. So, for now, I will put on hold any further gap charting or even pursuing gap shooting. The only thing I might continue to employ is the Point On distance. In long range shooting, which I consider 45 yards to be, I will use the point on to help me hit that target. Keep in mind, when it says “Point On”, it doesn’t necessarily mean to put the point of the arrow exactly on the bullseye, because you and your arrow are going to be flying from right to left (right hand shooter). So the point of the arrow is actually going to be somewhere to the right of the bullseye back that the line.